 Enjoy hot cross buns for breakfast on Good Friday, and at tea time or coffee break all Easter weekend (photo courtesy King Arthur Flour). 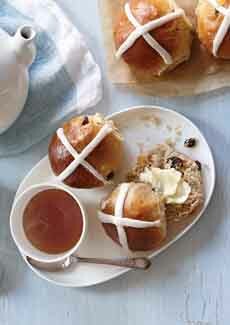 Hot cross buns are sweet yeast buns made with raisins or currants, and decorated with a cross. The cross, symbolizing the Crucifixion, was originally made with knife cuts in the dough. Today it’s piped or spooned on with icing. The buns are traditionally eaten on Good Friday. The first recorded use of the term “hot cross bun” appears in 1733. However, the buns have much earlier roots. As with some other Christian traditions, this one is believed to predate Christianity. In pre-Christian times, the cross is believed to have symbolized the four quarters of the moon. Hot cross buns are so tasty, we wish they were available year-round. So make some time to bake a batch. If you don’t celebrate Easter, make them to celebrate spring. Here’s a great recipe from King Arthur Flour. You can make the dough and the icing the day before, and bake them in time to serve them warm for breakfast on the morning of Good Friday.